This lead me to think someone I know who fell in love with someone who was already in a committed relationship. What started as harmless flirtation, a fling by all means, turned in to a full blown romance that lasted over six months. I asked her if she knew she was in love, and why she could not exit before it was too late. She said, “It was not an exact moment when I fell in love; I remember telling myself that I was not attached to him, and within weeks, I was on my feet begging him to be the stronger one and to walk away”. Filled with remorse of what she was doing – stealing someone’s man, she knew she had to end it. She tried, but they would always find their way to each other. When he said ‘I love you’, she knew he wasn’t lying; when she said it, her heart broke a million times over. When she finally found the courage to end it, and when she explained it to him, she described it as a ‘pointless’ love, a lost cause, and his eyes welled up and he begged her not to classify their ‘attachment’ as such. Women around the world face situations where they have to sacrifice so much in the name of love. They are the strongest. I can picture her, aimlessly perusing through pictures of him on her phone, you know, the make-believe relationship pictures for when she gets very lonely; swallowing that hard lump in her throat every time she heard ‘their’ song, ‘All of Me’ by John Legend. How she busies herself with a work load so monstrous so she can ignore that gnawing in her chest when she knew that he was with her. Then begin the imaginary conversations with him in the bathroom. She dares to sign her name with his surname, and rips the page off and stuffs it in the shredder. It must not be. WhatsApp and Viber are no friends at this point, constantly checking the time he was ‘last seen online’, she imagines what his day must be like. Did he miss her? Will he leave her and return to me? She hates herself for the final thought. For someone whose acquaintance was illegal, there were memories everywhere. It’s like a fog of memories spread over Colombo overnight. She took a different route to work and back to forget the times he held her hand and just looked in to her eyes for what seemed like forever, not saying a word, but communicating with his entire being. Then, there were the restaurants, hotels, supermarkets where she’ll play a game of ‘let’s pretend we’re a couple’. Again, I remember the girls who ‘man-hop’ with no worries, only STDs. How do they have casual flings and not even know their names? Surely, the government must freely donate a manual on emotional attachments to every girl over ten years. It’s more important that social sciences. I smiled now when I remembered another friend whose flings are so numerous, I have lost count and I repeat confirmatory sentences to make her believe I am following through the conversation, like Cosmopolitan advices. Such extremes, when in the light of facing emotions and allowing attachment; I relate better to the former friend. I have a clinical issue and I love the concept of love, and I am a relationship addict. I plan my children’s college trust at ‘hello’ and design seals to emboss our wedding invitations with our initials after the second SMS. I feel the need to beat myself with a cactus now. Is there a coping mechanism? Is there enough ice cream in the world to heal all the hearts that break, almost every second? I have loved and lost, but this must be the pits. It’s easy for me to imagine this, but how do some women withstand this? How long until you smile, meaningfully? How long until you muster the courage to delete over 500 pictures of him on your phone? 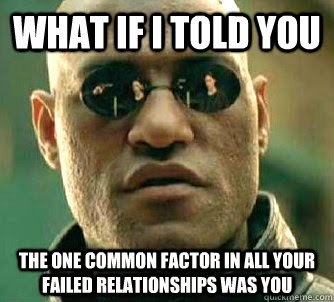 How many miserable rebound relationships until you hate yourself enough? I asked her, almost entertaining some perverse need to know how long she was able to hold on without wanting to speaking to him. She said, ‘Twenty minutes, and I missed him already’.